Revelation is situated in the old medieval church of St Michael at Plea on Redwell Street at the top of Bank Plain. The area is always well heated with 44 seats inside as well as use of the scented garden during the warmer months. Browse and shop at Revelation online for a wide range of christian books. Bibles, DVDs, candles, cards, gifts and church supplies. 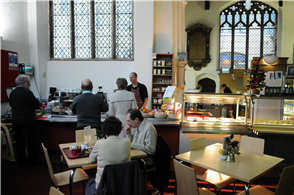 Norfolk Christian cafe Revelation is the new venue for regular drop-in sessions of a Norfolk veterans charity. Veterans Norfolk is a charity that brings together all Norfolk’s service charities to help Norfolk’s armed formed and veterans community. The group have relocated their drop-in meetings to the Revelation Resource Centre and Café, at St Michael at Plea Church, Redwell Street, on Wednesday. The drop-in sessions provide veterans, service personnel and their families with a safe place to go for help, from a friendly chat to support and advice with serious problems from outside agencies. The facility will be manned by volunteers from 10am until 2pm every weekday. The previous facility, the Britannia Veterans’ Centre has ceased operating as the Ministry of Justice plans to dispose of the building. The president of Veterans Norfolk, General the Lord Dannatt said: “Moving the facility represents a new start in a central location.